We are slowly pulling the house together, and the small powder room off our kitchen is next on my list. I'm hosting a baby shower at the beginning of February and would like my guests to have a pretty place to powder their nose. That, and the room drives me nuts right now. It's not big at all, just enough room for a sink and toilet. It has a (crappy) builder-grade vanity, plain mirror and basic sconce. 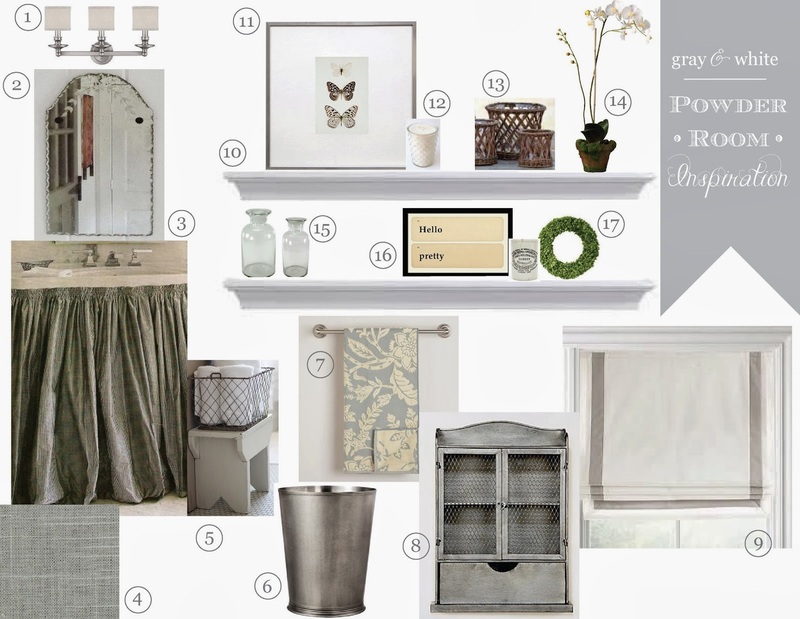 I won't be replacing the vanity right now (although this would be perfect) but I do plan to dress it up a little by removing the door and replacing it with a gray linen skirt to soften the look. This is sort of the direction I'm going. Since most of our house is gray and white, I thought I'd continue the theme : ) I plan to mix texture, pattern and a few fun punches to make the little space special. When sourcing mirrors, I realized I have a vintage etched mirror sitting in the garage. I had bought it for the shop but it was only $20, way cheaper than any other mirror I've picked out. 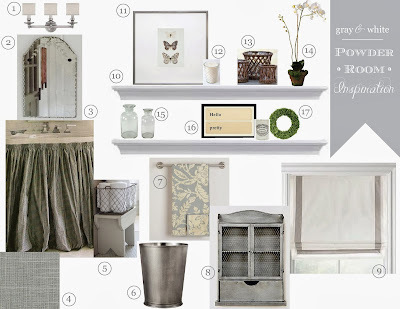 I'm not sure if I will replace the sconce right now just to keep costs down, but if I did I'd pick the one in the inspiration collage for sure! Eventually I'd love to add beadboard halfway up the wall, and maybe some wallpaper like this, but we're not tackling that right now. So for now the room will be all about accessories. I plan to hang two white shelves on the largest wall with a variety of fun little accents to add some interest. The room has a nice sized window with custom blinds, but I plan to make a faux roman shade to soften it. I can't wait to see how it comes together! This will be my after Christmas project so I will definitely keep you posted on things! Your plan looks fabulous, Courtney. Lucky you to already have the vintage mirror. I bought grey paint but decided to wait until after Christmas to paint our powder room. should look great..will look forward to the end result..